I have never lied to my son, not intentionally at least, not yet. Sounds like a lie, right? Well, I have made it my mission to avoid even the whitest of lies, the silliest of embellishments, and the most innocent of nudges. Why do I do this to myself? I mean, everyone lies a little, right? The simple, honest truth is that I want my son to trust me, down to the last word. No one will argue with me that honesty is usually the best policy, but not even my husband sees eye to eye with me on an all honesty, all of the time policy. What’s the harm in using parenting cliches? We have heard them our whole lives. “If you don’t eat your dinner you won’t grow up to be a big boy. Don’t you want to be a big boy?” Grandmas coo. “You are not getting out of the high chair until you finish your dinner,” Mommies warn. “If you don’t eat your vegetables, you can’t play with any of your toys tonight,” Daddies threaten. These are extreme examples, but you get the picture. These types of seemingly harmless comments just slip out of people’s mouths without thought. Maybe they were what we were raised with and so we believe this is how kids should be persuaded, through fairy tales, threats, and hyperbole. I know the point is to coax kids into doing what we ask, but the truth is, we don’t really care if they finish their dinner tonight or not (just one more bite would do) and no one is really going to leave their kid in the high chair over night! So why say things that aren’t true? You just make yourself out to be a liar! To be clear, my husband is the most honest, honorable person I have ever met. He keeps me honest in the rest of my life. But when it comes to certain little comments, he defends them as simply being easier than fighting with him over tiny things like more bananas. He just wants to protect Beau. What’s the harm in telling him a meaningless fib to avoid a conflict? I understand his point, but it isn’t enough for me. Everything we say to our children matters – every single time. This may sound like a huge burden on parents, and it is, but it is critical. Our words paired with our actions set the foundation for how well our child trusts or doesn’t trust us, and these bonds of trust are what will carry our relationship through the most stormy of waters later in life. From day one, children are constantly watching, listening, and learning. Kids are literal little sponges who absolutely do not understand hyperbole or sarcasm. They need the truth even if it means an argument might ensue. A) They need to learn how to accept the word “no” and deal with not always getting their way. B) They need to know that you will follow through with your statements. C) You want them to believe you when you speak. D) Trust goes both ways! If I offer him the bad news that he may not have another banana, he learns that I believe he can handle the truth! Me trusting him is just as important to the strength of this relationship as him trusting me. There are times when my husband complains to me, “He only listens to you.” I argue that that in itself is hyperbole, but I digress. Perhaps when it comes to listening to Mommy, he has learned that I am not hiding the truth. I have trained him to trust me by showing him that he can trust me in even the littlest, most harmless situations. If I tell him there are no bananas and then he goes into my purse and finds the bag, which he has started doing, he will start doubting other things I say and testing me in other areas. I would rather have a lot of little battles early on then a big one about trust issues later. So what about big things like Santa Claus, you ask? 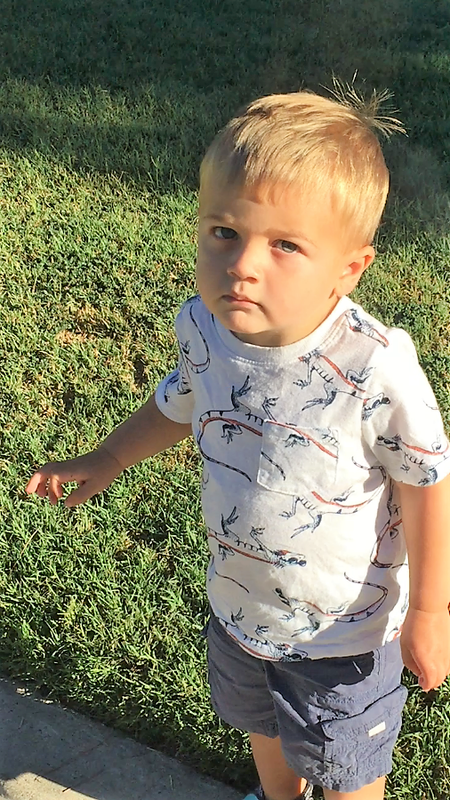 Am I depriving my son of our most beloved Western traditions because I refuse to tell a lie? No, so far I have just emphasized tales like these as being just that, tales. “Look, there is a man dressed up like Santa Claus over there” or “In the story, Santa Claus brings toys to good little girls and boys. Are you a good little boy? Would Santa bring you toys?” I don’t need him to actually believe — and fear — Santa in order to get him to enjoy the holiday season and to be a good little boy. Now, how to handle the tooth fairy? We aren’t there yet and I am still working on how I will that handle that one. I am open to suggestions! And what about the truth about our own less-than-perfect moments? My husband is adamant that he will not share his personal transgressions with Beau and I respect his wishes to maintain a blemish-free image in his son’s eyes. He says he will admit that he is not perfect, but that he will lie in an effort to protect his son from making the same mistakes he did. I, on the other hand, while not advertising my teenage troubles, will certainly open up to him in appropriate detail if he ever asks me about or needs guidance and support with particular issues. My hope is that because I have told him the truth his whole life, he will trust coming to me when he ever needs sage advice. I need my son to trust me. I know how difficult the teenage years are. Building a relationship with my son that will withstand his adolescence is of the utmost importance to me. I know that relationship started the day he was born and that we are forging it every day, with every word and action. The other day, Beau asked Daddy for a yogurt at an inopportune moment. Daddy said, “There isn’t any yogurt in the fridge.” I couldn’t help myself. “Really?” I asked. “Is that the truth?” knowing full well what the truth was. “No,” he replied. “Then why say it? It isn’t true. Just tell him he can have it in a little bit or even that he has to wait until tomorrow,” I needled. “I don’t know. I guess it’s just a habit. I will work on it,” he said. “Thank you,” I replied. Habits are hard to break, but some are absolutely worth breaking. Honesty is the best policy. Someday, when I have to have a sit down with Beau to discuss his own telling (or not) of the truth, I will share that old adage with him — and he will believe me. I pondered the meaning of the day a little more deeply as I finished dressing him. Independence Day: the day the colonists declared independence from Britain for being over controlling and not allowing the colonists any say in their own governance. 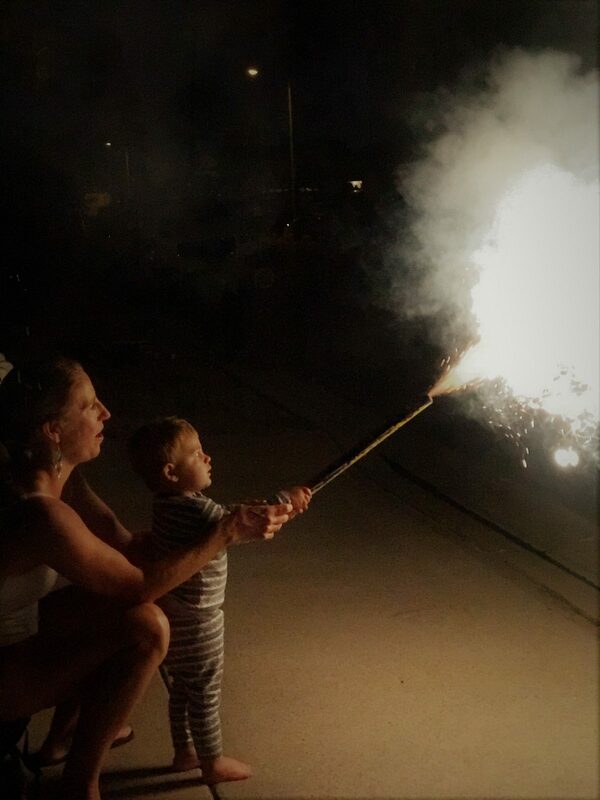 It would only be a matter of minutes before I would have to learn something this Independence Day about parenting my two-year-old. Beau and I moseyed into the bathroom to brush his teeth. Toothbrushing is usually something Beau enjoys, so I was totally caught off guard when he started refusing. I pushed, trying to hold him still while I attempted to safely enter the toothbrush into his mouth. But Beau pushed back, with tears, shouts, and lashing arms. 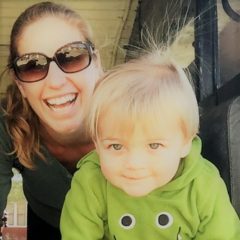 In the wake of my son’s second birthday, I am reading a lot about the “Terrible Twos” and how to survive them. One resource says the “terrible twos” are cause by an internal conflict between wanting to break away from overwhelming parental control and yet still wanting to remain close. This is a transitionary period when the child is feeling out his independence, trying to be and act older, and attempting to establish his identity in the world. He needs the freedom to explore and try – and fail – without the heavy hand of a parent controlling his every move. The terrible two-year-old’s tantrums are in a sense a Declaration of Independence! In writing the Declaration of Independence, the colonists listed the many grievances they suffered under King George’s heavy hand. They claimed that a government gains its power from the “consent of the governed,” and since he did not take into account their needs, they had the right to abolish his rule over them. They had addressed their frustrations with him over and over and finally, enough was enough. The colonists were outta here! Without the eloquence of language to express their demands, toddlers act out the only way they know how, emotionally and physically. Beau was expressing a grievance, and to avoid a Revolution, I needed to start listening. Better to start listening now. I know full well how kids go through a second transitional period in their teenage years which can end in full out rebellion. This is a time in Beau’s future that I seriously dread, especially after how I behaved when lashing out against what I saw to be overbearing control by my parents. Kids need to learn how to be adults, how to take chances – and how to fail – and to become who they are going to become, just as they did when they were two. However, unlike at two, a teenager may really say, “I am outta here” if you don’t listen and those consequences are devastatingly frightening. Working out a way to share control with Beau is something I would like to perfect early. If King George had heeded the warnings of our Founding Fathers, we may still be a part of England today. Instead, we declared independence fought a terribly long war to finally break free. I never want to fight that war with my child. I will listen to his grievances and support him in any way I can as he transitions into independence. So how did I handle the toothbrushing tantrum? Through goofy silliness, I managed to get Beau to stop protesting long enough to hand him the toothbrush. Usually I brush them for him so this time, I asked him to do it. He brushed the bottom row pretty well and then gave the brush back to me. I urged him to brush the top and I could see the tantrum resurfacing. Abort! Abort! I thought. “OK, Beau. Nice job on the bottom row. We’ll get the top later.” In giving him some control, we had a half-brushed mouth until bedtime, but the Revolution was averted. This particular battle was not worth spoiling all of the day’s fireworks! When brushing before bed, Beau said, “Mommy do it?” I smiled and hugged him. See, he still needs me (sigh).